Lawn Fertilizing adds nutrients, including nitrogen and potash to you lawn. Fertilizing your lawn enriches it with nutrients, encouraging new growth. Fertilizing your lawn is important as it will lead to a thicker, healthier, and greener lawn. Home Owners that fertilize their lawn will be less likely to suffer from weed, insect and disease problems when it’s fertilized on a regular basis. So Save Green by going Green and fertilize your lawn this season. Highland Park Lawn Co. customers depend on us to keep their lawns looking great all season long. You can too! Our technicians are full-time, commercial pesticide applicators licensed by the Nebraska Department of Agriculture with an average of five years experience on the job. They keep up to date on the latest research by attending conferences and workshops provided by the University of Nebraska Turf Grass Science Team. We are fully insured and our friendly and courteous office staff will be here to help you. Our standard 4-step program covers most of your lawn’s fertilization and weed control needs. We also offer much more. Our 6-step deluxe program adds a grub control application with season long control and a late season winterizer fertilizer to insure the health, thickness and beauty of your lawn. Spring or fall aeration will improve grass rooting and reduce compaction and thatch. 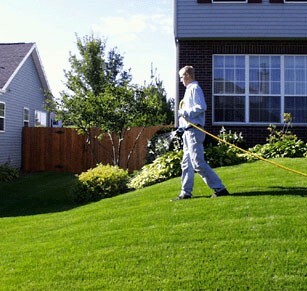 We can also handle special needs for lawn diseases. If you would like to be notified before each application just let us know.